The "Great Adventure" is not just an ordinary tour. This is a unique opportunity to overcome difficulties, to challenge oneself, and finally to feel proud of all your deeds. The Program is aimed at developing independent skills. You will need to make a choice: to travel in catamarans along a river or to travel on bicycles in the forest. During the first several days of your stay at the Camp you will learn how to make a fire, to cook meals, to put tents, to provide the first-medical aid, to sail on kayaks and catamarans, to travel on mountain bicycles. You will require this knowledge and skills during your tours and expeditions. After consulting your instructors and new friends you can choose the most suitable variant of your trip. The Great Adventure Youth Camp in Karelia started to work all the year round. In summer the program of the "Great Adventure" is divided into three levels of complexity: The Level Pioneer is the first primary Level; it is available for everybody, who is 13-17 years old. The Level Explorer is available for those who have been in the Camp at least one time. The "Masters of Travelling" is the top priority of the Great Adventure; this program is for those, who had been in the Camp two times before. After preparation in the Base Camp the masters" will set out on a 28-day tour on catamarans along the Kola Peninsular. During the preparation for the expedition you will have to get through the Rope Courses - a program of special exercises helping to develop coordination, adroitness and team's spirit. These exercises are carried out on logs, fixed at a considerable distance from the earth; the participants use special mountaineering insurance devices. They will become a serious test of your physical fitness, ability to work in the team. We also organize groups during autumn and winter vacations. 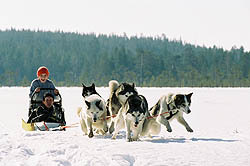 You will master our Courses "The North Explorer" and like legendary polar pioneer explorers will learn how to drive a dog-team and finally you will be able to take part in a winter adventurous tour and to feel the thrill of real adventure. The Youth Camp has existed for eight years. 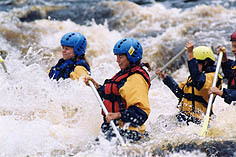 During three summer months in 2007, autumn and winter (beginning of 2008) the Great Adventure welcomed about three thousand teenagers from different regions of Russia. We would like to invite you to spend your holidays in Karelia together with us!